I've never been one to lack confidence. I've stated at least 2,356 times on this blog that I was raised to think I could do and be whatever I wanted. My parents did not raise me like this on accident. But I also do not think they thought I would fully embrace this attitude and become this belligerently confident gUrl who decided to move to a huge city one day without a job or any money just because most of my friends were married. They have admitted more than once that my independent attitude very much cramps their style. It always has. 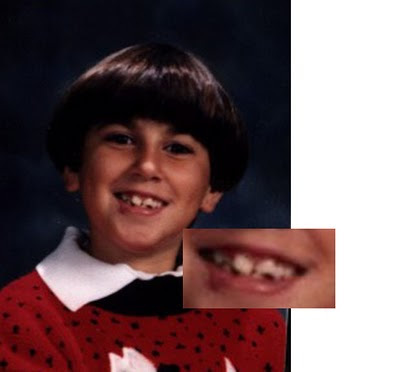 You'll notice that my hair is in the shape of a mushroom and my teeth slightly resemble the Rocky Mountains. How could I, a person that looks like this, think anything positive about myself or even the world in general? I don't know. Clearly, I knew from a young age that personality makes up for looks and dressing ugly is perfectly acceptable as long as you say you're trying to be funny. It does, however, become unacceptable when on more than one occasion you have seen a homeless person dressed in the same outfit. I do realize that I'm very fortunate to have grown-up completely and whole-heartedly naive to the fact that I very much resembled a boy growing up in the Appalachian Mountains with no access to a mirror or dental care as a youngster. I was abused as a child too.... I had that same scottie dog sweater. No wonder we're such great friends.